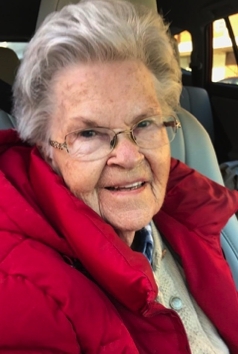 Estelle Etheridge Lynch, age 91, of Roanoke Rapids, NC died Tuesday, March 19, 2019 at Halifax Regional Medical Center. Mrs. Lynch was born in Roanoke Rapids, NC the daughter of the late Claude and Willie Jordan Etheridge. She was a retired employee of Halifax Regional Medical Center and a member of East Tenth Street Church of Christ. Surviving are: a daughter, Julie Lynch Allen and her husband Lewis of Smithfield, NC; a son Claude T. Lynch and his wife Sandra of Littleton, NC; a sister, Ezelle Pepper of Jackson, NC; Sister-in-law, Linda Etheridge of Pikeville, NC; two grandsons, Toby Brady and his wife Catherine, Marc Allen and Marisa; three great grandchildren, Jax, Eliana, and Gia; and a caregiver, Blanche Rose DeBerry. The family will receive at Wrenn Clarke & Hagan Funeral and Cremation Service, Friday, March 22, 2019, from 12:45 to 1:45 PM. Graveside services will follow at 2:00 PM, in Cedarwood Cemetery, Roanoke Rapids, NC, with Rev. Randy Martin officiating.